Expensive mega-blockbuster motion pictures seem all the rage, but when the subject is UFOs the less costly celluloid messages translate well. 'The UFO Incident," regarding the Barney and Betty Hill case, is a seventies NBC-TV movie starring James Earl Jones and Estelle Parsons, and an incredibly well-produced docu-drama whose mystery and terror engulfs the viewer's mind through faithful depictions of hypnotic regression and the influence of things often unseen. I think most folks familiar with the UFO topic know about this one. Perhaps lesser known is "The Disappearance of Flight 412," another movie (available on DVD) presented first on NBC-TV, aired in 1974. Starring Glenn Ford (an Air Force officer as well as an actor, and I do seem to recall that he had some very strong opinions about UFOs), David Soul, Bradford Dillman and other known actors (including Guy Stockwell, whose low-key, yet somewhat chilling portrayal of a government intelligence officer carries the storyline quite well, and Ed Winter, who went on to star in the final episodes of Jack Webb's NBC series, "Project UFO"), this very low-budget feature is a must-see. Most who have watched this oldie probably had no idea that its script was based upon the personal military experience of one of its writers, Neal Burger, who borrows from something that happened in 1951. Even as independent UFO researchers who produce their own documentaries have shown, huge budgets are nice, but not always necessary. As far as commercial TV networks go, considering the amount of worthless slop they turn out every day, it borders upon amazing that the profoundly thought-provoking films mentioned here ever made it to the small screen. Then again, that was another era of free television, apparently gone forever. Every so often, I pull something out of the blog archives and feature it again. 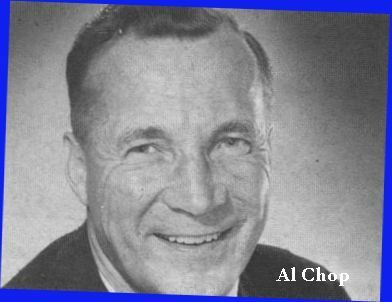 Today I'm summoning the memory of Al Chop, borrowing both from this blog and from my blog about the 1956 movie, "U.F.O." The two letters here were written almost 10 years apart. 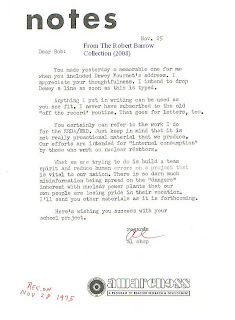 For your interest, the 1966 letter on NASA stationery reflects Chop's confirmation that the people involved with "U.F.O." tried diligently to make an accurate motion picture (though both Chop and Tom Towers, who played the role of Al Chop, wished for more of that "Hollywood touch" to conquer the movie's wooden dramatics). He also clarifies that he left the UFO organization NICAP to avoid public confusion between his UFO interest and NASA public affairs duties. By the mid-seventies, Al was affiliated with the government's atomic energy program, responsible for in-house publicity programs and editor of an employee newsletter, and he mentions all of this in the other letter reproduced here. At some point, he sustained a serious back injury which effectively put an end to a long government career, spanning his service time as a Marine, to his role as Air Force press desk chief at the Pentagon, to his exciting years with NASA and ultimately with a division of the Atomic Energy Commission. I just thought it timely, having caught new readers up a bit, to mention Chop's relationship with and confidence in nuclear energy. Having survived Chernobyl and Three Mile Island -- both future events at the time of Chop's letter -- the U.S. appears poised to embrace nuclear power more than ever, and one hopes the safety factor embraced by Al Chop accompanies its growth, as we discover that solar panels and wind alone won't solve our immediate needs, even in an unlikely post-petrol human existence. Also, lest Al Chop's name always be consistent only with government UFO reports of the early fifties, I think his nuclear project relationship presents an interesting coincidence and ironic complement to the fact that UFOs at nuclear missile bases are quite newsworthy now. 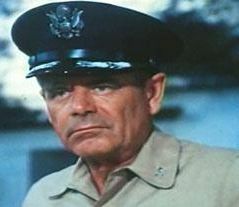 As Robert Hastings and former Air Force Capt. Robert Salas prepare to host what should be a monumental press conference, regarding UFO encounters with nuclear weapons, at the National Press Club in Washington, D.C. on September 27, it's just noteworthy in a peculiar sort of way that Chop was in the middle of the action in 1952 when UFOs appeared over the same city, and that he eventually took an active interest in things nuclear himself. Chop progressed from UFOs to "nukes," and UFO investigations, in a very significant way, shifted to UFOs AND nukes. There's no esoteric message here, just a perspective. Were he still living, Chop might be amazed at the mounting evidence linking UFO activity to nuclear missile facilities. Or, knowing something of his pragmatic approach via a fair amount of correspondence, heck, maybe I'm wrong and Al wouldn't have offered so much as a shrug. Over at the Virtually Strange Network (see link), Errol Bruce-Knapp's "UFO Updates" section offers a daily sequence of messages from veteran UFO researchers and serious individuals, and if you haven't made "UFO Updates" a part of your daily Internet life, I encourage you to do so (check out the pod casts conducted by Errol, too). 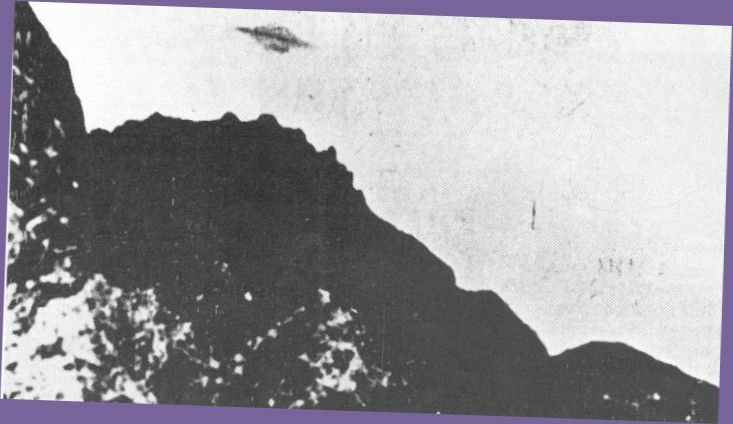 Last week, "UFO Updates" contributor Kentaro Mori initiated a literary firestorm of responses when he reported that the Brazilian TV program, "Fantastico" revealed that the famous series of Saturn-like UFO photos allegedly taken in the Trindade Isle by Almiro Barauna were faked. Barauna's niece would not be interviewed herself, but supposedly confirmed through a friend that Barauna assured her long ago that he joined two spoons together and photographed the "UFO" using his refrigerator as a background. The Trindade photos have been controversial for years but, yes, there was a floating consensus among some that they provided good photographic UFO evidence. This may still be the case, because we really don't yet have the definitive proof of a hoax -- but proof may be coming soon, if there hasn't already been further information released. We'll have to wait and see. Perhaps nothing will be settled at all. The stories behind still photographs of purported UFOs have a history of collapsing months or years after their appearance -- all the more reason to crave military photographic evidence and photos or films confiscated from trusting private individuals and never returned. I'll certainly be disappointed if the Trindade photos are hoaxes, because I gladly used one of the series as a visual in my first magazine article in 1967. Actually, lots of people depended upon these particular Brazilian photos to enhance their books and articles. But you never know in these matters what may transpire as the future unfolds like a spider's web of deceit. Apparently, the critics are already out there condemning the praise that the (former) Aerial Phenomena Research Organization (APRO) and other organizations and researchers lavished upon the Trindade photos after their own analyses. I consider this most unfair because investigators could only rely upon the analytic means available at the time years ago, and in addition to methods we only have witness accounts to mull over when all is said and done. Among honorable investigators, photos were always a thorny issue, but somebody had to perform the arduous work and they did their best. That is to say, when one acts on a "good faith" basis, conclusions should be respected on the basis of their veracity until further information arises. This is a far cry from some known members of the UFO "community" in the past who went out of their way to "confirm" the authenticity of obviously ridiculous photographic images on every possible occasion. For better or worse, real or fake, the Trindade photos won't be the last, joined as they are by films, videotapes -- and the terror of digital images that anybody can fake with total confidence any morning of the week, and happily pile upon world Internet gullibility long before breakfast is ready. It's funny how history repeats itself, and even funnier when nobody really knows about the first time an event occurs. For instance, EMP -- electromagnetic pulsation -- receives a fair amount of attention in the news currently, primarily because governments and scientists fear enemies can cripple computers and, indeed, all functions and devices requiring digital communication in a wide area with the proliferation of EM waves. But anybody with a working knowledge of UFO history realizes that electromagnetic energy -- or something very much like it -- was disabling autos on highways around the world during UFO sightings at least as far back as the 1950's. Did folks read about these incidents in their local newspapers? Sometimes. Area newspapers and radio stations would pick up on the stories, report briefly and then the stories were gone forever -- but generally the press avoided widespread reporting because. . .because ( I hate trying to speculate here). . .probably because the stories seemed unbelievable, though a few carefully measured lines might be good for a laugh. Ironic, really, considering that even barnyard animals reliably appeared to detect errant energy sources, as noted extensively in UFO literature. It's not very comforting to think that the common animal sense of a farm's jackass could exceed editorial judgement at a major newspaper. The news media could and should have done a lot better with the UFO subject since the early days. Many of you look forward to a time when the U.S. government reveals what may be an incredible file load of information supporting the existence of UFOs as intelligently controlled objects. When and if that day comes, where and how will blame be affixed for years of denial? After all, we're all looking for somebody to hold responsible whenever some long-delayed truth emerges. The nation's newspapers, once a powerful and untouchable force in keeping the people informed, aren't doing so well anymore. The Internet -- and the almost garden-nourished explosion of ignorance and plain old stupidity, a former term now garnished with fancy-sounding medical diagnoses -- has seen to that. News magazines aren't faring much better, Newsweek having been sold for a dollar a few days ago. Even Time Magazine just sent me an ad in an envelope marked DO NOT BEND with, curiously, nothing bendable inside, begging me to re-subscribe at the special senior citizens' (how dare they!) rate of $20 for 57 issues, while the non-ancient are asked to pay $256.96 at the newsstand, if you can find one. Not only did Time offer $236.96 in savings, they offered to add SIX ADDITIONAL MONTHS absolutely free. My GOD, sounds like those Time people are darned nearly ready to mug victims and sign up unwilling subscribers in the streets. I plan to hold out for a $1.50 deal and a free two-week vacation in Switzerland, enjoying in-flight service in both directions by everybody's fave flight attendant, Steven Slater, current Jet Blue public relations representative-by-default. But yes, the newspapers are in trouble, the news mags are in jeopardy and commercial TV network news programs continue to lose viewers. So I'm wondering, if disclosure ever comes and a certain percentage of the public rises up in, not panic, but rage because we've flat-out been lied to by the government for decades, where will that anger be focused? 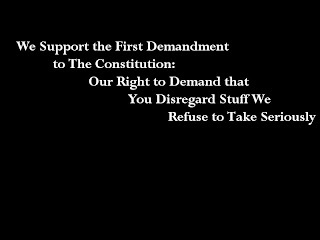 On the government? Maybe momentarily, but how long can a nation's citizens vent their anger at a gigantic faceless government entity whose public officials primarily responsible for the cover-up have mostly retired and died off over the years, or yet hide in a vast bureaucracy? Pointing fingers at the dead is great for about five minutes, but then what? Where do you direct the hostility? Who gets the down-home blame? Maybe some will look at the media. The most accessible resource is newspaper archives, and among a mountain of history accomplished via the extraordinary efforts of journalism's finest are occasional news or feature articles regarding UFOs. Depending upon the newspaper, some archives will contain well-researched UFO-related pieces, while others reveal a long policy of making light of UFOs and the people who see them. More to the point, however, is editorial policy. Newspaper publishers dictate the standards they wish each edition to follow and practice, and editors must satisfy the publishers by upholding each newspaper's print personality. The question may be asked one day, why did publisher Jones or editor Smith exhibit a penchant for ridiculing local, national or foreign UFO reports? Why did so many editors on so many editorial pages pen entries showing a complete lack of interest in investigating the UFO issue? How come they made light of witnesses or wasted considerable space quoting supposed debunking "experts" who, as it turned out, didn't know any more about the complexity and gravity of the UFO issue than they -- and, frankly, couldn't have cared less? Yes, Mr. Editor, alive or long deceased, it's your name on the masthead and your editorial policy when all is said and done. There, in newspaper archives both large and small, is evidence in writing of each editor's and editorial staff's fairness, understanding of the issues and judgement of the evidence. Even the UFO evidence. What will reflect one's editorial legacy? A call for scientific investigation? Or ridicule from the hip? Of course, it's easy for me to criticize newspapers, because their archives are so popular and essential in a free society -- and, as you know, I frequently quote old newspaper articles and news service reports here on the blog. Newspapers remain integral to our lives and I hope they continue to survive as monuments among the tools which truly helped build the USA and the lives we live. But then there's the rest of the media. There have been newspaper and magazine editors and publishers who discouraged their reporters from writing about UFOs, but I think such instances are rare. They seem more likely to occur among radio and, particularly, TV media. When, for example (and I encountered this personally in recent years), a local TV news show on a station in some major city doesn't mind offering the occasional feature about psychic squirrels or the like, but its owner or news editor strictly forbids its staff to report about UFOs -- even when a UFO news feature that already aired boosts viewer ratings (a common benefit) -- one has to wonder. 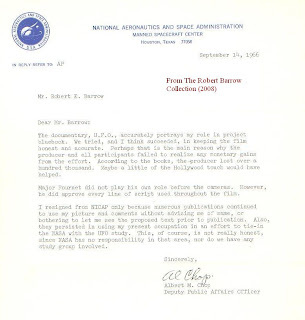 With the invention of videotape and now digital media to conquer the age of film reels, TV news archives are probably a little more common than they once were, and obviously their content would reflect editorial and station owner approach to the UFO subject. Naughty or nice? So we ask: If national UFO disclosure comes tomorrow, which long-term editorial policies will do a newspaper or TV station's historic archives proud? And which will tarnish or destroy a newspaper's reputation? What happens on the national media level? With other nations quickly releasing their own UFO files of one sort or another, and with more information coming to light about airline cases and the incredible Rendlesham Forest/RAF Bentwaters series of events emerging, the press would do well to cut the nonsense, ignore the ever-present pigsty of debunking "authorities" and start reporting the facts with all the seriousness of a traumatic international incident. FACEBOOK? ME? In response to inquiries, no, though there are apparently people on Facebook who share my name, I'm not a member and find no reason to join. I'm sure Facebook is a final social network site, but since I'm neither particularly social nor enthusiastic about anything with the word, "network" attached to it, I'd be more likely to smear myself with tuna and jump into a dumpster full of starving cats under romantic moonlight at midnight. Now, there's a photo for Facebook. So Stephen Hawking thinks we need to get the heck off this planet, but we don't have much time to do it -- oh, and there's really no place to go in the short term, anyway. We may as well go back to sleep. At least Steven Slater, the new public relations rep-by-default for JetBlue, knew what to do (whatever the truth of this incident, whose foundation has been thrown into question) -- You grab a microphone, thank the cordial among you, tell everybody else to go to hell in colorful terms, grab a couple of beers and slide down an airplane chute to escape the madness. I guess that's sort of what Hawking was saying, except we don't have any reliable destination at the end of the chute. And Patricia Neal died this week. The entertainment folks were making a big deal about her major film performances, such as a role opposite Paul Newman in Hud. I know Hud was a fine movie, but I remember Ms. Neal for her appearance in 1951's The Day the Earth Stood Still. The remake couldn't beat the original. The remake. Well, I had been looking forward to seeing the new version of the movie, The Day the Earth Stood Still, but only got around to that a few months ago. Spectacularly bad film! Keanu Reeves had no reason to show up, "Gort's" brief presence as a computerized studio creation was about as frightening as a house cat attacking a litter box, and the script (which bears almost no relationship to the original) often seemed estranged from, yet encumbered by, any action or inactivity on the screen. Worse for me was the production's disintegration into a stock film environmental statement -- and as somebody who used to fondly embrace and donate to environmental causes, which I currently find ruled by too many radicals and impressionable folks inspired by political agendas and half-baked ideas posing dangers unfathomed, that's saying something. Yet, there were two moments when I almost wanted to cheer. The first was when the motion picture mercifully ended. My other brush with satisfaction occurred when extraterrestrial technology began destroying everything in its path on the planet and the camera lingered for a few seconds as a huge sports stadium was eaten out of existence by nanobot-like thingies. Go team! I don't much like stadiums, though I understand their importance to the masses. We've become far, far too focused upon the game, the game, the game, whether it's "professional" football, baseball, basketball, soccer, skateboarding or any variety of diversions one takes on, serving as an alternative to keeping a close eye on politicians who deal dirt behind closed doors, themselves in full approval of the anesthesia administered via Big Sports. Stadiums and professional athletic events in conjunction with rock concerts and an abundance of other fluff frequently quench the brain thirst exhibited by people who don't even know the names of their local legislators or congressional representatives, and frankly couldn't care less. Many recognize names and decades-old statistics regarding their sports "heroes," but can't write a paragraph using proper English -- or any English at all. In addition, as I've said before, I never encountered a dog who couldn't catch a Frisbee every time, retrieve a ball consistently or put a generally round object into a hole without the assistance of a team of coyotes -- and they didn't lap up absurdly overpriced contracts to accomplish their super canine feats, either. Nor do dogs routinely find their names in the press for betraying their clean role model images, only to reveal themselves publicly as the innate thugs they are. Well, I guess I should be grateful that the movie remake demonstrated some positive annihilation. Truly, the world would televise, sell and worship flyspecks if a profit could be realized. What a month. Patricia Neal's gone, Churchill and Eisenhower aren't available for prodding in the UFO court, deploying airplane emergency exit chutes on a whim may soon become hugely fashionable, there's evidently a new "super bug" without a cure starting to make rounds on the planet, Leslie Kean's new book is reportedly exceptional (that's a good thing), machinery isn't working well on the space station and Stephen Hawking says get off the planet soon, except Mars still needs a good cleaning and an interior decorator and there's no other place to go -- not even to the space station. Big Media hit the chuckle switch and its members lovingly obliged. The British government just released its latest historical collection of UFO-related documents, and of immediate interest to the international press was an alleged incident near the end of World War II, when an RAF flight was reportedly pursued by a metallic arrow-shaped object. OF COURSE, time has passed and the photo(s) reportedly taken are nowhere to be found. 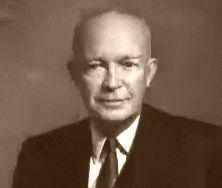 The selling point here was a report that Winston Churchill and Gen. Dwight Eisenhower had a meeting regarding the mystery, and Churchill supposedly ordered that the event be kept under wraps for at least 50 years because a public revelation would cause panic and interfere with societal faith in religion. I performed a quick review of various TV, newspaper and news service reports -- and there were many -- mentioning the RAF incident, and while it was great to see so much publicity about this little chunk of history, knowing what would come next required no psychic abilities whatsoever. As if by ancient instinctive guidance, one news report after another made certain to throw in the "X-Files" TV show, "little green men," a separate report by a witness who told of "Stargate aliens" and -- of particular abundance -- the anecdotal information about a gambler who placed bets on the probability of extraterrestrial life. Big Media sorts it out, you see. And, obviously, the usual battery of debunkers emerged one by one from underneath the rocks which shelter them between media reports, well rested and ready to babble on about how UFOs ring meaningless because they simply can't exist in the debunking universe. Big Media sorts it out, you see. A hundred explanations and a baker's dozen of dolts effortlessly wait in the wings, as if on call, to obfuscate science's true calling. Big Media sorts it out, you see. If the British account is accurate, Churchill may have been barking up the wrong tree of knowledge. Members of The Church may have handled the RAF report far better than the debunkers whose self-assurance sabers have traditionally cut truth off at its knees, both publicly and within governments. But Big Media will sort all of this out, you know. I guess I'll just sit back and wait for the next saucer joke for the media to report and shower with winks of not-quite-derision-but. 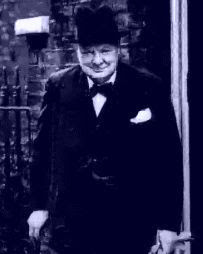 In the meantime, I suggest the Obama Administration apologize (they're globally expert at this) to the Brits and beg them to return that gift bust of Sir Winston that White House minions couldn't wait to pack up and return to England, perhaps because some war heroes are sooooo yesterday. At least for a while, old man Churchill is gonna enjoy renewed fame, but the Lighter Side of news reporting will make sure things don't get too serious. Who would have thought? Tom Towers, who played the role of Al Chop in the much under-appreciated 1956 United Artists documentary motion picture, "UFO," wore several hats in the aviation industry. Prominent amongst them was his role as aviation editor for the old Los Angeles Examiner, and Tom paid as much attention to the UFO enigma as he did to routine aviation affairs. 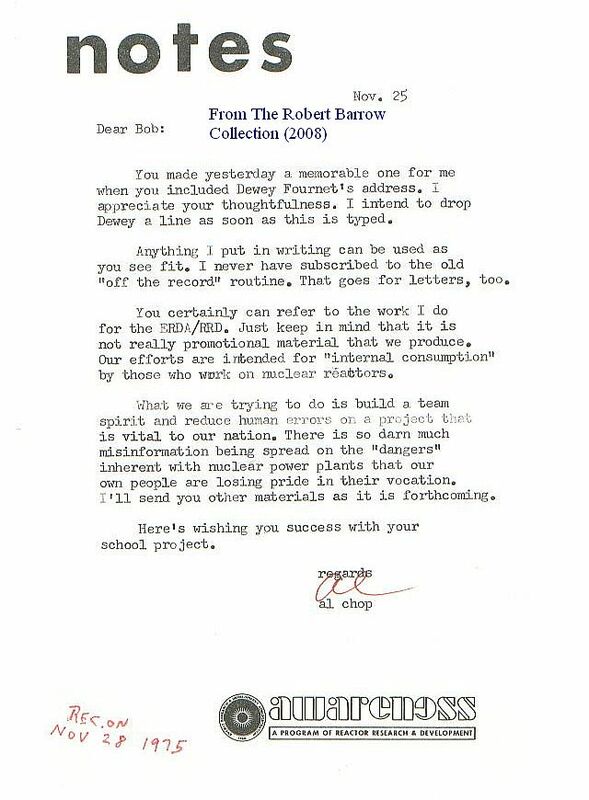 I just posted a couple of things about him over at my UFO movie blog, and this column from the now long-defunct Examiner is one of them, courtesy of researcher Barry Greenwood. Tom Towers passed on a few years ago, but fortunately we still have Billy Cox (see link), a real newspaper journalist who writes regularly about the UFO subject in his blog.